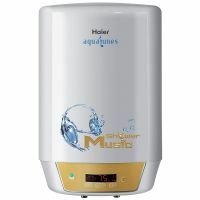 ES15V P3 geyser water heater is 15 liter Capacity with ABS Outer Body. It,s 8 Rated Pressure (Bar) and SafeCare Technology. This geyser water heater comes with 5 Star Rating (BEE) and Digital LCD Display. It has also comes with feature Remote Control, Real Time Clock and Adjustable Thermostat. With a wireless controller, users can have all the smart settings in hand for convenient use. To Recieve updates and possible rewards for Haier ES15V P3 please sign in. To Recieve updates and possible rewards for Geyser/Water Heater please sign in.